Indigo is very proud to present Myanmar Tourism, directed by Ron Fricke. What we’re featuring here is the glorious 3 minute online version. The 30sec version is now airing globally on BBC World. Please look out for it. Shot over three weeks it showcases many of the stunning and rarely seen cultural icons of this fascinating country. Imbued with Ron’s unique visual style this is a deeply spiritual piece which instills a sense of wonder, and invites the audience to “let the journey begin..” Enjoy. 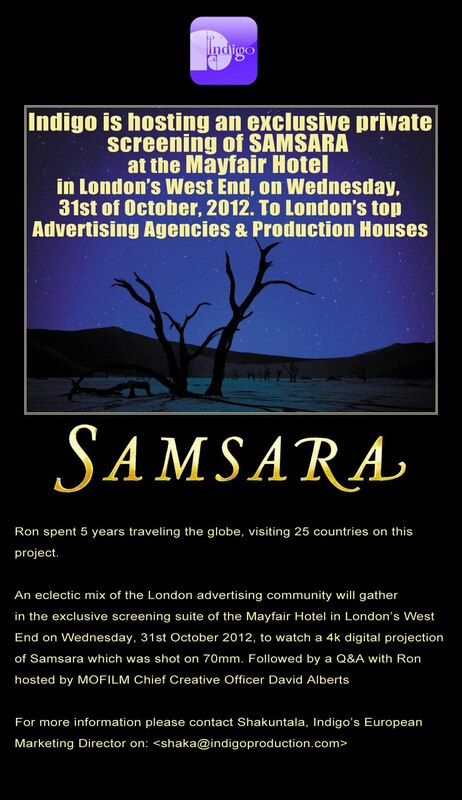 Ron is exclusively represented by Indigo Asia Production. Final polish going on a very exciting new project Directed by Ron Fricke. More later.